On the eve of the 21st United Nations climate summit in Paris, France — a city in which I will arrive on Friday morning, Dec. 4, the News & Observer of Raleigh runs on its Sunday front page a story of mine regarding what’s at stake for the talks and what obstacles lie ahead to meet carbon emissions target to slow the rate of global warming. The story also appeared in the Charlotte Observer, and likely other McClatchy newspapers in the chain. John Knox, a Wake Forest law professor and special UN representative on climate change and human rights, was a key source. This entry was posted in Environment and tagged Chrls Lang, Climate change, COP21, emissions gap, forests, global warming, Jason Funk, John Knox, land sector, Obama, Paris, Steve Panfil, UN climate summit, Union of Concerned Scientists on November 29, 2015 by Justin Catanoso. I was a staff writer for the News & Record of Greensboro from April 1987 to April 1998 — 11 years. When I decided to take the job as executive editor of a new weekly newspaper in town, The Business Journal, I was asked to leave the paper immediately, even though I was prepared to give at least four weeks notice. Today, Nov. 29, 2015, I have my first byline in my old daily newspaper in 17 years. It’s a commentary on the UN climate summit in Paris, France, which I will cover for mongabay.com. 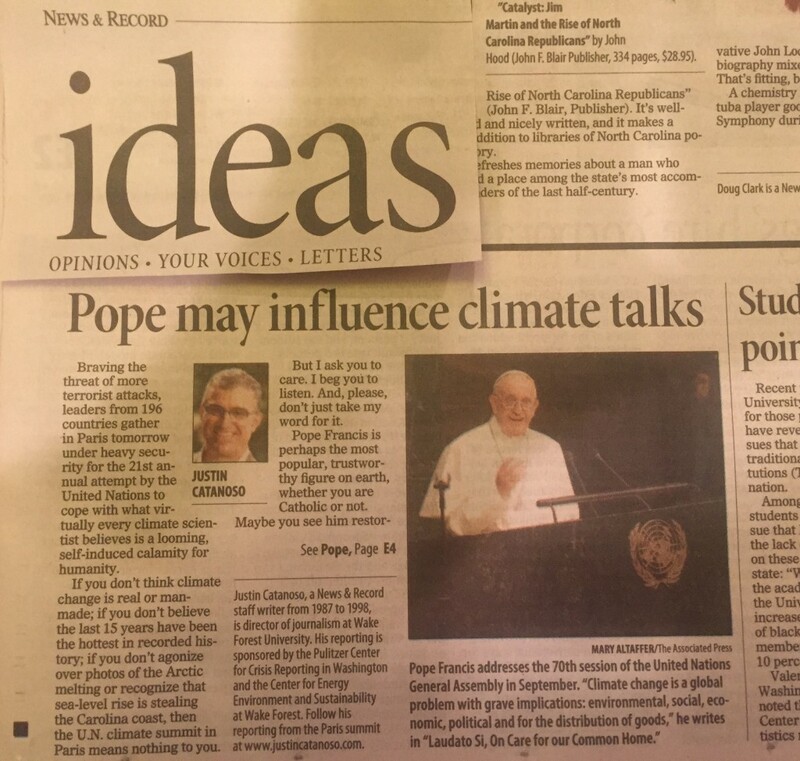 This entry was posted in Environment and tagged Climate change, COP21, Elizabeth Gandolfo, Evan Berry, global warming, John Knox, Laudato Si, papal encyclical, Paris, Pope Francis, UN climate summit on November 28, 2015 by Justin Catanoso. Indonesia on fire, October 16, 2015. 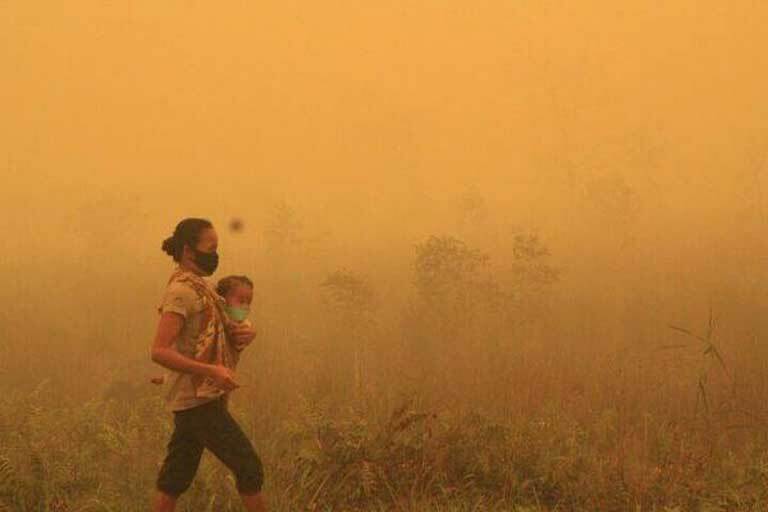 An image posted on Twitter purporting to show the smoke-choked city of Palangkaraya. Damages from the record wildfires has already topped US $30 billion; acrid smoke has sickened half a million people. “This is my urgent call… Guarantee the future of Oceania. Change society to a low-carbon lifestyle,” said Monsignor John Ribat, President of the Federation of Catholic Bishops’ Conferences of Oceania and the Archbishop of Port Moresby, Papua New Guinea. Glenn Scherer, my talented editor at mongabay.com found this photo to run with a breaking news story I wrote for the web site on Oct. 27, 2015. Jim Yardley, my friend and New York Times bureau chief in Rome, let me know about an important Vatican press conference that would be streamed live on Oct. 26 and that I should “cover” from my office at Wake Forest. Amazingly, I did. I split my screen with the Vatican’s YouTube channel on one half, and a Word doc for notes on the other. As Glenn’s cutline points out, the bishops call for a binding, transformative agreement at COP21 in Paris in December is critical. I made my 6 p.m. deadline, Gleen edited it expertly and filled it in with amazing photos. The story is here. This entry was posted in Environment and tagged bishops, Climate change, COP21, global warming, Jim Yardley, Kyoto, mongabay.com, Paris, UNCCC on November 6, 2015 by Justin Catanoso.